One of the best additions to Epcot’s Flower and Garden Festival this year might be the Piggylicious Bacon Cupcake. 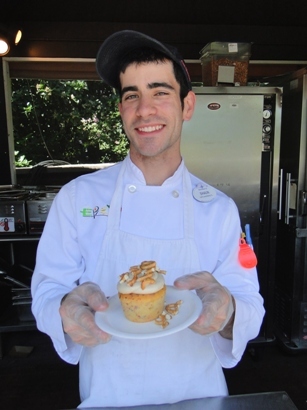 Found at the Smokehouse pop-up food café in The American Adventure pavilion, these bacon cupcakes with a maple frosting and pretzel topping are arguably one of the most popular food items this year. 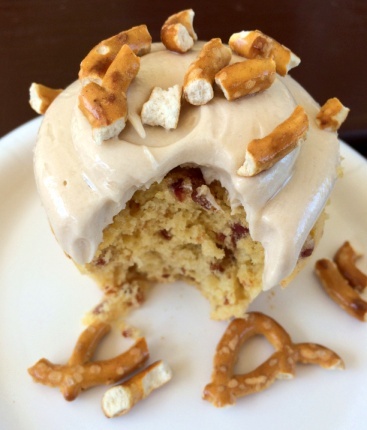 The beauty of the bacon cupcake recipe is that you can do it at home just by adding ingredients to a boxed cake mix! The following recipe, shared by Disney Executive Chef Robert Gilbert, shows how to easily recreate this recipe at home. Put cake mix in a bowl. Add bacon fat, water, and eggs. Beat ingredients with a hand mixer according to the package directions. Fold in the cooked bacon. Add mixture to cupcake pan and bake according to package directions. In a mixing bowl with a paddle attachment, cream together the cream cheese and butter until light and fluffy, about 8 minutes. Add maple flavor until combined. Add powdered sugar until well mixed. 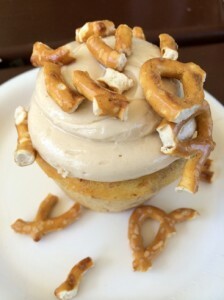 Frost each cupcake with the frosting, and garnish with crushed pretzel twists.